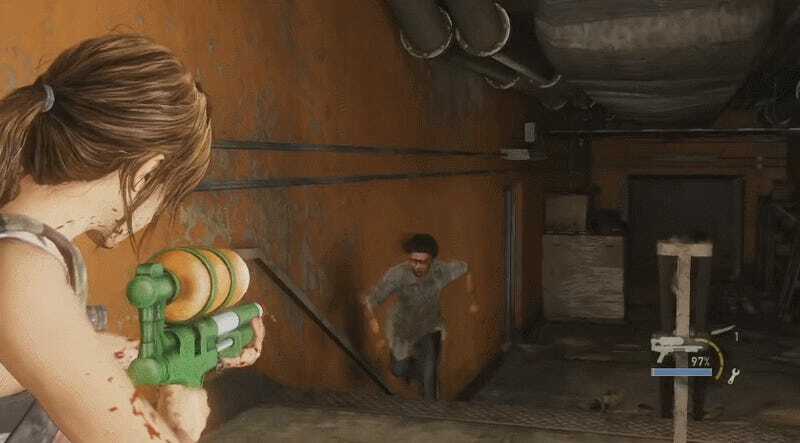 Most people have fond memories of the water gun fight from The Last of Us: Left Behind. A nice break from the grim, apocalyptic weight of the rest of the game, that section of the DLC lets Ellie and her newfound friend, Riley, get to pretend for a just a few moments that they’re just normal kids not living in a zombie hellscape. It was a nice change of pace and showed the game could extend beyond the previous limits of its emotional range in some interesting ways. “Speaking of... Those water guns you’ve been dreaming of. I nearly got shot for these. Surprise,” says Riley. But what if you could use the water gun from the “Fun and Games” chapter on, like, actual zombies? Thankfully, YouTuber Freako employed a few tricks to answer the question on everybody’s mind and see just exactly how that would work in the game. It turns out the zombies from Last of Us don’t like super-soaker water one bit. The mod he employed includes what Freako calls “flagging” another section of the game where Ellie is only supposed to be able to use a knife to allow her to use whatever else is in her inventory, including the water gun. “I was in the water fight section of Left Behind and I saved the game and took the water gun from the inventory in that save and injected it into this file,” he says in the video. As a result, Freako was able to pull the water gun out and douse infected creatures with some very weirdly rendered H20. It turns out that when you do this, they just sort of...fall down. Apparently, doing so also puts the game’s particle physics on the fritz, leading to lots of other bizarre animations as well.